This is an odd one. 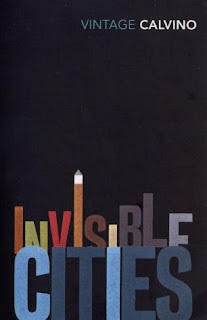 I don't even know whether I can really call Invisible Cities a novel or not. This isn't the first time I've read Calvino's work before; no, my first introduction to his work was 'Night Driver', a short story that firmly places his work into the postmodern. Even knowing that, I'm still not sure what to make of this. The blurb of my edition states two things. First, that the book is Marco Polo talking to Kublai Khan about the cities within his realm, all of which are actually aspects of his home city, Venice. Second, a quote from Gore Vidal that states, "Of all tasks, describing the contents of a book is the most difficult and in the case of [...] Invisible Cities, perfectly irrelevant." I would be more inclined to believe Gore Vidal. While you do get scenes of Marco Polo and Kublai Khan talking, it is pretty bare and lacking conflict as a "plot"; in my head, Invisible Cities is more an exercise in world building than it is an actual novel. The majority of its chapters are 1-2 page descriptions of a fantastical city. How many of them are supposed to relate to Venice, I'm not sure; the only ones that rang true for me was one with canals (obviously) and one which is constantly under construction for fear that it will crumble once construction ends (it brought to mind the rapidly crumbling foundations). Just because their relation to the real world is tenuous at best is not a criticism from me. Far from it, in fact; whilst I was discussing what I was reading with my boyfriend, we realised just how much potential each of these cities contained. There was something about their weirdness, their unique spin on a city, that really captured my imagination in a way that I haven't experienced for years now. I'm trying to work my nerve up enough to try to read this in Italian someday, but in the meantime I appreciate your questioning of whether it can be called a novel or not. That appeals to me! Very nice blog, by the way--just discovered it last night and look forward to coming back and exploring later (love the sorts of books you've been reviewing of late). I would love to know how it differs in the original language, so you'll have to let me know, as unfortunately I don't speak a word of Italian. And thank you very much. I look forward to hearing more from you if anything comes up that you'd like to discuss, or if there are any books you would recommend.